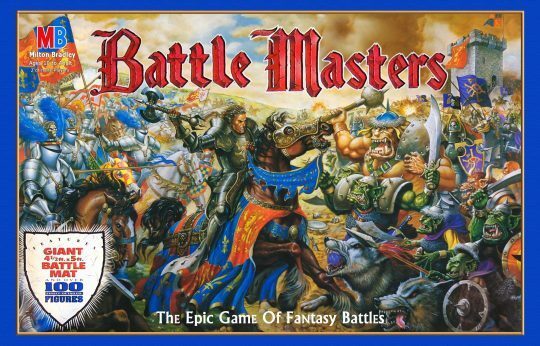 Battle Masters is a fantasy miniatures battle game by Milton Bradley, presumably licensed from Games Workshop. The sizeable game box comes stuffed with tons of plastic miniatures, a deck of combat cards and some dice. Players move and fight their armies based upon what card is turned over from the deck. Combat is held on a large vinyl mat 4.5 ft square (Actual Measurements: 55 inches by 57 inches). Welcome to the world of Battle Masters – the epic game where you command mighty armies locked in a legendary conflict of good versus evil! The noble Imperial Army is ready to meet the Forces of Chaos. You and your opponent must strategically guide 25 army units, featuring over 100 finely-detailed figures, across the gigantic 4 1/2′ X 5′ Battle Mat. Beware! Ditches, marshes, river fords and the great Border Tower lie before you. The battle unfolds as each turn of a Battle card tells which army units can move and which can attack. Will your army be victorious, or will your opponent destroy you? Who will survive the battle and win the game? The fate of the Empire is decided by you, the Battle Masters! Note! The following cataloged from an open game. They should be considered minimums!